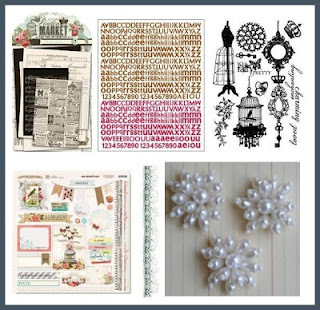 Erin Blegen: My Scrap Cabin: C'est Magnifique Full Kit Reveal!! Good morning :). I hope you're all well! 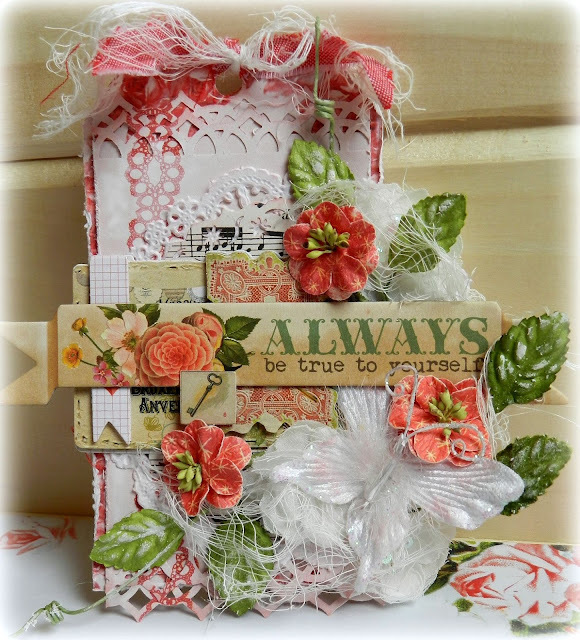 I know I am- I get to show you the full July kit reveal for C'est Magnifique! As previously mentioned, I love this kit- it's stunning. And I can guarantee you they won't last long- so if you'd like to purchase a kit for yourself, visit the July section of the store here. 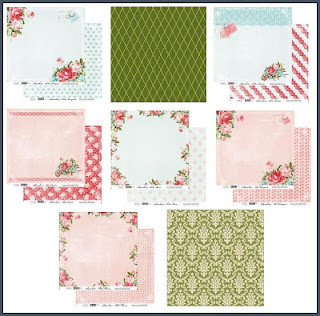 Of course, if you'd like to make sure you receive one of C'est Magnifique's one-of-a-kind kits every month- check out the join page here. But before I share with you the full reveal, let's take a look at a couple more of my projects I created with this kit. I will show you a couple of them today and the rest tomorrow so as not to overwhelm!! This is a photo of my little girl, playing in the grass at my mom's house. When picking out the papers to assemble this layout, I was trying to figure out what I was going to use to "anchor" my photo- when I saw and realized that the Pink Paislee "Collage Sheets" packaging was a perfect, coordinating fit! I just love little lightbulb moments like that! Add some stitching and a bit of trim tied at the top, and you have a beautiful, upcycled embellishment . You can see why I love this kit so much!! It's gorgeous :). Thanks for coming over today~ will be back tomorrow with one more layout and a card to complete my projects for July. LOVE LOVE LOVE LOVE LOVE all of them!!!!!!!!!! Yes, that packaging is so perfect for grounding the photos. Love to recycle and get every penny's worth out of my scrap goodies. Beautiful work, Erin. Beautiful creations, Erin!! I really love the colors in that kit, so pretty!! Your tag is awesome, can I have it ;)? Beautiful, as always, Erin! 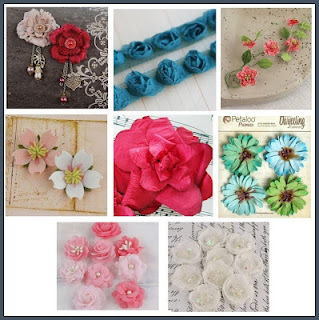 I love how you can make a boy page out of these feminine items...so gorgeous. 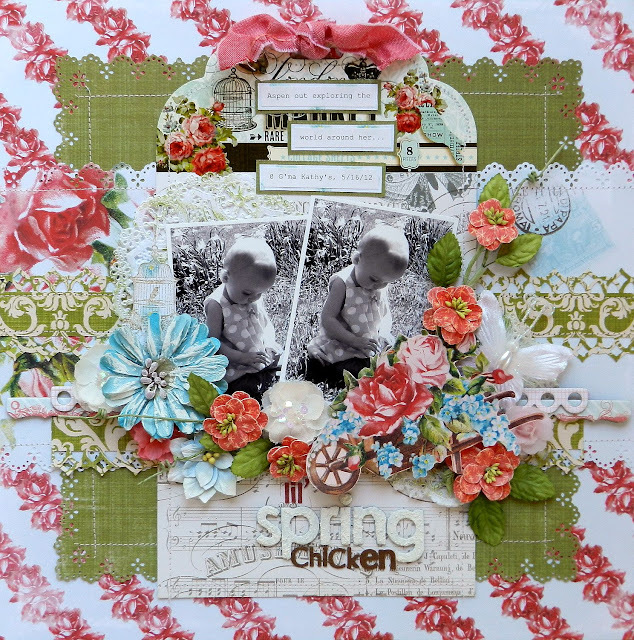 I love the pinks in the Spring Chicken page...so perfect for a girly page. That tag is amazing...so many great details. Love them all! LOVE that title for your first page Erin, and the green, blue, and brown looks really awesome togehter! And the packaging on the second one, was a perfect ground for your photos!! Sometimes the packages are just as good as what's in them!! :) The tag is really gorgeous and you did such a great job with everything in this kit!! WOW! These are just beautiful! Love it all! My favorite is Gunner's LO. 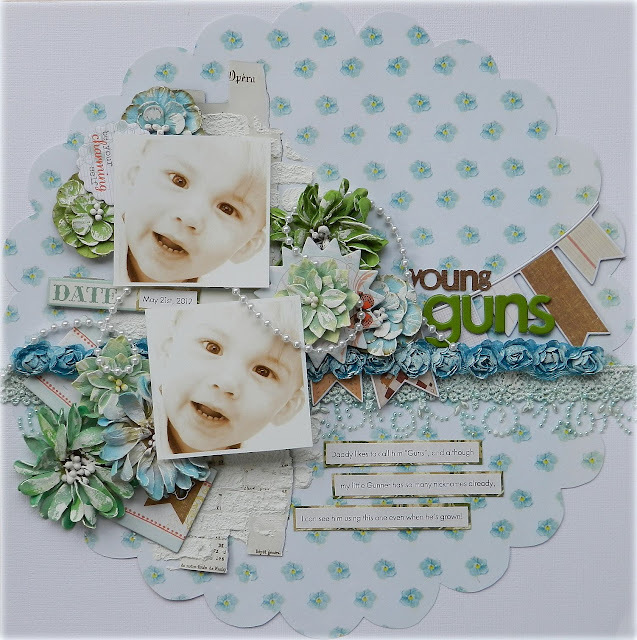 Love the blue roses, the die cut paper & the crystal border. So much to look at and take in! Your creativity ceases to amaze me. Two gorgeous layouts and one beautiful tag! Can't wait to see what else you have to show us! Wow! 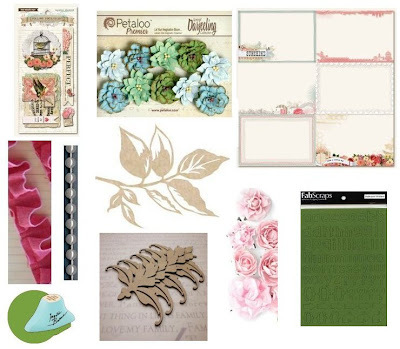 the kit looks wonderful and you have used it so beautifully, so many details on each layout.. gorgeous photos, so many layers and stunning papers and flowers.. each one a masterpiece.. love them all!! Totally blooming gorgeous my dear! Each and every one of them but especially the tag! !